I am 6'6" so interior room is an issue, head room and leg room. What manufacturer/years are worth more money? Even though i'm not build the truck to sell it and make money, its nice to know that my $10,000 is worth it when it comes time to sell it. My cousin owns a Mustang and Miata dismantling yard so NEW ford parts are easy to come by, but i think i like the chevys more. What are some recommendations for a first timer? Sweet little truck... & always gonna be worth a mint!!!! MIne is the 56 F100 Big back window always goes up in value. But I'm "kinda" partial to 72-80 D & W series Dodge Trucks!!!! I would have to say the most popular classic trucks are the FORD 53-56 F100. I own this 56. I don't care for the early Chevy trucks but the later ones are nice. As far as value, again the 53-56 keep going up. Although I am partial to the '56 Fords, but the best truck is the one you are working on! Remember, it's not the truck...it's who is inside that makes the ride. all those trucks look good and mine is the one that I am working on at the time. I LOVE the Chevrolet pickups. But any of these trucks lowered makes them all appealing. its amazing how the stance of the car can make it look sooo much "cooler"
I like the 57 Camaro b/c it is not a step side. But i honestly would take the 53-56 or the 55-57 Chevrolet pickups as long as they are short bed! WHAT DO YOU GUYS THINK OF THE THE STUDEBAKER PICKUPS? Please promote "Whats your favorite classic Truck?" 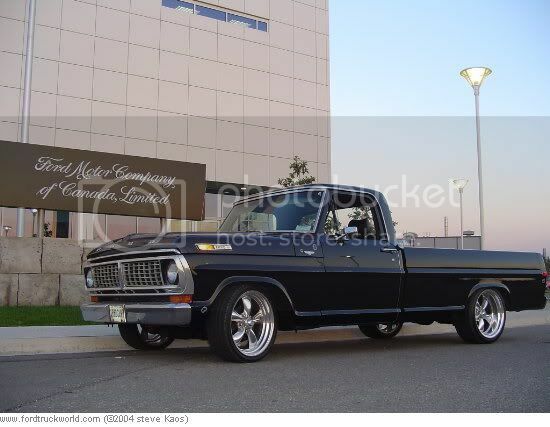 Forums : General Discussions : Whats your favorite classic Truck?